The elegantly-shaped glass, the sophisticated concert of subtle tastes and complex aromas, the cool, refreshing euphoria – all of these things define, for many of us, the extraordinary experience of savoring a good beer. Behind this experience is great passion… and technology. Currently creativity in beer production is again becoming a popular trend. Alongside well-known favorite brands, it is also delightful to try something new and special. The dynamic trend of craft beer has emerged, blending local tradition, special ingredients, unexpected flavors, secret recipes and slow brewing – which has more to do with brew masters’ innovation than with industrial mass production. The capacity of brewing equipment, however, is not decisive in achieving a good or bad result. The one thing that really does make a difference is how automation technology supports the brew master to put his ideas into practice and to refine his creations. Is automation flexible or limiting? Do changes have a reasonable or dramatic budget impact? Does the technology support a quick or slow time to market? This article highlights for system integrators a way to integrate a brewing process control solution using zenon. The following generic solution is designed to widely fulfill general requirements in the food & beverage industry, while identifying opportunities to accommodate particular brewing-specific or individual requirements. In any given project, the system integrator typically requires the valuable input of a process specialist, such as the brew master, in order to define the user requirement specification (URS). 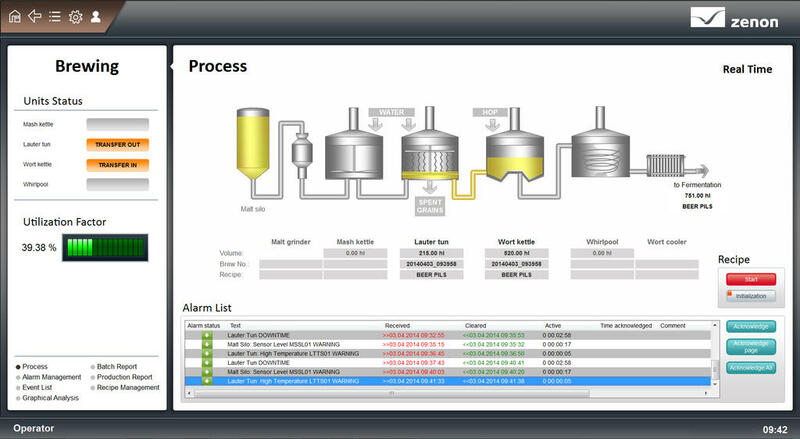 The zenon Software Platform brings several essential features to the entire brewing control solution. In response to today’s appetite for creative brewing, zenon is prepared to make the difference and deliver competitive advantage through flexibility at reasonable cost. Good automation technology can help everyone in food & beverage production and system integration to be more successful, with more satisfaction and less stress. This is what zenon delivers. This is the taste of ergonomics. Cheers!